OVERSEAS STUDENTS - Please pay attention to the following questions: 9, 13, 19, 23, 25 and also the Apply page. Q. 1 How can I get news of your courses? Q. 2 Do you supply a complete catalogue of all courses? A. 2 Due to both environmental and cost considerations, we are no longer supplying a complete catalogue by post. The last year we had a printed catalogue was in 2008 but requests for it were very few so it was discontinued. Since then, the cost of postage has risen astronomically. Details of all the courses we offer are on this website. More and more people are using the internet to browse information and details of all available courses are on this website. Q.3 What is the legal status of your certificates and diplomas? A.3 In the UK - unlike many other countries - private certificates and diplomas (but not degrees) are automatically legal. A college does not need permission from any government authority to award a valid certificate or diploma in most subjects. Thus, every UK College of Holistic Training Certificate or Diploma is a genuine British qualification. Most UK education in the fields of complementary and alternative medicine, personal growth, counselling and hypnotherapy, is run by private colleges, and private schools are to be found offering many other subjects. The UK has a long tradition of private, independent education in many fields. 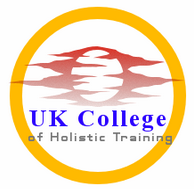 The name "UK College of Holistic Training" is a trading name fully owned by our founder and Principal, Morris Berg. There is no government requirement to register the names of private non-limited adult educational colleges, or non-limited business names. We are registered on the UK Register of Learning Providers database under UK Provider Reference Number 10028354. This is a government-approved list. Thought it is not an accreditation it is an official acknowledgement that our existence as an education provider has been confirmed by a government agency and our details verified. Q.4 What is the difference between a certificate and a diploma? A.4 The title "diploma" is used widely in the UK for courses which in the US might be called Certificates. In the UK and most other English-speaking countries (except the USA), a Diploma can mean a course that is more advanced than a Certificate in the same subject, or it can mean a specialised or professional course. There is no hard and fast rule about what is a Certificate and what is a Diploma, and it will vary depending on the course provider, the field of study, the accrediting body (if any) and other factors. The length of the course may not be a useful indicator of Certificate or Diploma status and one cannot automatically assume that either a Diploma is higher than a Certificate or vice versa. Sometimes, a Certificate from one college will even be a better course than a Diploma from another. Private colleges as well as state education providers issue certificates and diplomas of many kinds in the UK, and the issue of certificates and diplomas for courses of study (and sometimes for professional society memberships) is not regulated. If you are in the US, or in another country where the word "diploma" is not used or is confusing, we may be able to alter the wording of your award to suit your needs - please enquire. Q.5 What is an Advanced Diploma? Q.6 Are your courses recognised? A.6 This is a common query, though it is hard to answer without specifically asking if a course is recognised by a specific body. The word "recognised" means nothing by itself. There is no such thing as universal "recognition" of qualifications, and to ensure a course meets your needs, you may need to make enquiries with the bodies, employers or authorities you want the course to satisfy. For details of recognition and links to professional associations, please see our Societies page. Accreditations and/or validations, if they apply, are given on individual course pages on our site, and may vary from course to course. Please refer to the pages covering the courses you are interested in. We research other forms of recognition from time to time with view to submitting applications to the relevant organisations. However any such initiative must not compromise our ability to easily introduce new subjects, including those that might be controversial or of minority interest, and must not detract from our ability to make independent decisions regarding course content and operation. If you are outside the UK and wish to use one of our courses for private practice, it is your responsibility to contact the appropriate authorities or professional bodies in your country to see which types of training they will accept. We cannot do this for you. In many cases there will be specific local requirements that can only be met by study in your own country. Please read the course web pages carefully. If you do not see the specific type of accreditation you need on the course web page, that means that the course does not have that form of accreditation. Q.7 Will I be able to join a professional society or professional register of practitioners? A.7 We have built a special societies page for more information. Please read that page and also the specific course web page. Q.8 Will I be able to get professional insurance? A.8 There are several insurance companies or intermediaries in the UK who handle applications for professional indemnity insurance from complementary therapists, life coaches, etc., and we will give you further information on request. The insurance industry does cater for independent therapists. You may also join the insurance scheme of whatever professional society you already belong to, or ask if they will extend your insurance to cover further therapies. Q.9 Do I need to buy textbooks? A.9 Most of our courses require textbooks. It is essential to read the course description on the website to see how many books are needed. Shorter courses may need one or two books. Longer courses may need 6 books or more. UK students get one free textbook with most shorter courses, but they will need to buy all the necessary books for longer courses. Students outside the UK do not get any free books and must buy all necessary textbooks. We do not sell books and students should be able to buy from one of the major Internet bookstores such as Amazon.com Please budget for the cost of books, plus the cost of airmail postage depending where you are. Students in developing countries in particular will need to be very careful to ensure they have sufficient funds for course fees, books and airmail postage. Please read each course description in this website carefully to see whether there is a free book entitlement. We reserve the right to make changes at any time - information on this website will sometimes be more up to date than information appearing on third-party databases where we advertise our courses, since it takes time to publish any changes on all the internet directories where we advertise our courses. When deciding if a student is regarded as "in the UK" for free book purposes, what counts is where the student is physically present when he/she enrols for the course and whether we can send the books to a UK address. The student's nationality, country of permanent residence or permission to stay in the UK are not taken into account. In other words, we ask ourselves, "Can we ship the book to a UK address using inland post"? The Channel Islands and the Isle of Man count as parts of the UK. BFPO addresses also count as part of the UK. (b) Courses using exclusive university-level textbooks written by US academics. These textbooks are not available for sale through the usual internet bookstores, but can be ordered on demand from a specialist US site as downloads at very affordable prices. A Paypal account will be REQUIRED in order to order these books - students can be in any country but the MUST be able to pay by Paypal or the scheme will not work. If students require printed copies of the textbooks, they can be printed on demand but printed books plus postage from the US will be very high, and we recommend that students outside the US take the downloadable versions. (c) Courses using materials written in-house and distributed as PDF downloads. Courses using these new models will be announced via our mailing list and social media pages as well as appearing on this website. The individual web page for each course will contain details of the method of delivery. Q.10 Will I receive a printed diploma and will I be able to use letters after my name? A.10 All UK College of Holistic Training graduates will receive a handsomely printed certificate or diploma suitable for framing. Most courses will have designatory letters which can be used after the student's name, for example Dip. S.M.R. for the Diploma in Stress Management and Relaxation. If you subsequently join a professional association, you will be able to use whatever letters are permitted by the association for your grade of membership. Q.11 What is required to practise counselling, life coaching or psychotherapy in the UK? A.11 In the UK, there has been so far no compulsory government regulation of the professions of counselling, psychotherapy, stress management, life coaching or hypnotherapy. In theory, people can practise those professions with no formal qualifications at all, but that would not be wise and you have a moral obligation to have training if you are working as a professional. There are several major bodies who claim to be the most prestigious and well-recognised professional associations in the field. To take a training accredited by one of those bodies takes years, involves classroom attendance and extensive personal therapy, and is very expensive in terms of time and money. Many people drop out because they cannot afford to continue, and so those prestigious trainings are more and more restricted to an elite who have the wherewithal to stay in training, or who are lucky enough to obtain very scarce funding. However, due to the unique educational freedom that exists for the time being in the UK for therapy training, there are many private training bodies linked with various smaller professional associations in all areas of the country, that provide professional courses in counselling and psychotherapy in different formats. Part of this market comprises the schools who offer distance learning in counselling and psychotherapy. Distance learning in those fields is well-established and UKCHT is proud to be one of the providers in this area. Our distance learning counselling/therapy courses are ideally aimed at people who have some formal or informal experience of counselling or helping: there are nurses, teachers and mental health workers amongst our students. The courses can also be taken for personal interest. To get practical experience, we suggest that students contact local volunteer and self-help groups who often have places for volunteer counsellors. Such groups will often offer additional specialised training. For further information see our Societies page. Q.12 Do you provide distance learning courses in hypnotherapy? A.12 In 2014, we started to provide a distance learning introductory qualification in hypnotherapy that was originally written by another UK teaching body, and it has been expanded by us. The course will be tutored by Morris Berg, our principal, who has multiple qualifications in hypnotherapy, regression therapy and NLP and is a Fellow or Member of several UK professional societies. We also provide several specialist advanced hypnotherapy courses for qualified practitioners. Q.13 Will my qualifications be recognised abroad? If you already have adequate qualifications to work in a non-UK country, or if there is no particular control in your state over the field in which you wish to practise, you may use our qualifications abroad. In all other cases, we suggest you obtain local advice in the country and/or state in which you wish to practise. In the USA, Canada and Australia, you should check with the state authorities as regulations can differ considerably from state to state, and you could be allowed to practise lawfully in one state but not in the next one. State regulations can also change from time to time. Our general advice is to always make extensive regional enquiries if you are considering practising abroad, and talk to local practitioners and professional associations to find out what you may need. UKCHT qualifications are not accredited by any government-approved body giving automatic recognition outside the UK. However, like all other UK qualifications, our courses attract interest internationally, and many students take our courses because they already meet the conditions for practice in their own country, and they wish to study with us for further or specialist education. Q.14 Do you provide a job placement service? A.14 The UK College of Holistic Training does not have a job placement service. Our qualifications are mainly for self-employed professionals and may also be taken for personal interest and professional development. Employers who are interested in our graduates are welcome to contact us with view to placing a vacancy announcement on our website or in our newsletter. Q.15 How do students on therapy-related courses get experience and practical training? A.15 Many students are already practising some form of counselling, therapy or helping and take our courses to further their professional knowledge and gain professional qualifications. Ways of practising certain techniques taught in our courses can include practising specific exercises on family and friends and experience may also be gained by becoming a volunteer counsellor, helper or trainee with a local self-help or voluntary counselling service such as (in the UK), Mind, Victim Support, The Samaritans, Cruse, a self-help group for a particular illness or condition, a church-related counselling service, or a hospital patient support group. Often, groups will make arrangements for further specialist training or skills courses. We do not arrange placements with such services: we suggest that students make local enquiries. Q.16 Do you offer "A" levels, or NVQ accredited courses? A.16 The UKCHT does not offer Advanced Level tuition or National Vocational Qualification (NVQ) courses. Q.17 Do you offer payment plans? A.17 Due to general economic circumstances, we probably will not offer any payment plans for the foreseeable future. If applicants need credit, we suggest that applicants arrange their own credit by paying by card via PayPal. (We do not take credit cards directly). Alternatively, you can save up until you can afford the course. Also see Question 20 below. Q.18 Can I study with you if I do not use a computer and/or the Internet? A.18 In many cases, yes if you are doing one of UKCHT's own courses. Study may be carried out entirely by correspondence provided the course does not use multimedia material. However you will need to buy books for certain courses so you should be able to arrange to purchase these from a bookshop. We also will need to charge extra fees for manual delivery of certain courses especially to overseas due to high postage costs. We can also quote you for shipping textbooks for your course to your address, if you cannot order online. If we do that we will need to charge a handling fee. If you are outside the UK, delays in postage will add considerably to the time taken to complete your course, and this plus the cost of printed materials and postage means that we do not recommend a non-computer route for non-UK students. Q.19 Where do I get textbooks for the courses? Many of our courses need textbooks. Please see the individual course web pages for details of textbooks. Students in the UK will normally get a free book for a shorter course but will have to pay for books if the course requires several books. However as mentioned in question 9 above we will be introducing new models of course delivery and those will have different arrangements. Please see our buybooks page for details of where to by books if you are outside the UK. Q.20 Do you have scholarships or is financial assistance available? A.20 We regret that we have no scholarships and that UKCHT courses are not participants in any government grants or funding of any kind, due to the amount of red tape that would involve. It is the student's responsibility to ensure that he or she has the means to pay for the course. To avoid the waste of your time and ours, please only send an application form or contact us if you know that you can pay for the course. We do not have any payment plans at present. Q.21 Can you put me in contact with other students or past students? A.21 No - due to stringent data protection regulations. Q.22 How can you help students with disabilities? A.22 How we can help depends on the individual case. Most courses use textbooks published by mainstream publishers and provided students can read the books or obtain assistance with reading them, we can assist by supplying our instructions in large print, accepting assignments recorded in mp3 format, or co-operating with a helper who writes/records the work for the student. We can provide feedback and tutorial support by the most suitable means at our disposal. We will make allowances for dyslexia and suggest alternative assessment methods where appropriate. We have had deaf and partially-sighted students as well as those with autism and dyslexia. No attendance is required at any time so difficulties with travel are not a problem. Where a student has a helper or carer to assist with learning activities, we are prepared to offer a free place on the course to the helper/carer so that both he/she and the disabled person receive the qualification. (However, one place must be paid for.) We do not know of any other college making such an offer. The inability of publishers to provide versions of their books and materials suitable for the blind and partially-sighted is an industry-wide problem, and most educational texts and other serious books are only available in visual form. If an audiobook is available it should be listed on Amazon. Using software that can read printed text aloud may help some students, and some partially sighted people have access to equipment that can magnify printed text on a large screen. Q.23 Do you have local representatives abroad? A.23 The UK College of Holistic Training is being advertised internationally on the Internet, where people all over the world can find us. All our distance learning is administered from the UK. At present we do not have any representatives or agents overseas for the courses featured in this website, and we are not seeking such representation. Any possible representatives in the future will be recruited from amongst our own students who have first-hand knowledge of how we operate, and who are able to assist in tutorial work. We cannot, at this time, promise that such positions will become available. If you find anyone outside the UK claiming to offer UKCHT courses, please check with us first and let us know their full details! Q.24 Does the UK College of Holistic Training have a campus? A.24 Like many other private schools providing tuition in therapy, alternative and social-science related fields, the UKCHT is decentralised and does not have a campus. Our Central London address (which we have used for many years) handles our mail and our telephonic communications are based in London. All communications are routed to the Principal and/or tutors as necessary wherever they are located. In the UK, many institutions that provide classroom training in alternative and complementary therapies do not have their own college building or campus. Typically, they hire rooms in universities and other venues to conduct their classes. And some “holistic” colleges with UK addresses actually have their headquarters outside the UK! At present all of our tutorial and admin work takes places in the UK. Q.25 Can I obtain an Apostille for my certificate or diploma? A.25 The short answer is: possibly, but it will be difficult and expensive, and it will not help you use the qualification abroad. The Apostille is a government seal that, in the UK, is given to notarised documents to certify that they are legal in any country that subscribes to the Hague Convention. (The Hague Convention is an international agreement for recognition of foreign documents.) The Apostille can also be used in other countries where it might help to establish that the document is legal. In the UK, Apostilles are issued by the UK's Foreign Office. In principle, it is possible to obtain an Apostille for your UK College of Holistic Training certificate or diploma and we can suggest a private agency who will arrange for notarisation and Apostille if possible. However, this process is complicated and can be very expensive. It can cost more than your diploma tuition fees! The document first has to be notarised by a Notary Public who, in the UK, is a lawyer with special training. Notarial fees, and the associated courier and Apostille costs, are very expensive in the UK. If you want the service, expect to pay several hundred pounds and possibly extra for handling charges. The Apostille is only one part of getting your document accepted as genuine in another country. The next step is called “legalisation,” which would be carried out by your country’s embassy in the UK. This is another expensive process - the embassy may charge a fee of several hundred pounds. They may then refuse to grant the legalisation seal, without a refund. Even if you pass this hurdle, remember it is not an accreditation and has no educational meaning. You may still not have the right qualification to practise in the other country. Also, although the Apostille indicates that the document is genuine and legal, it is still necessary for you to check what qualifications you need in the country you wish to practise in. Having an Apostille for a certificate does not mean you can automatically set up a practice anywhere outside the UK. It does not override local laws and regulations. Local laws in other countries and states may make you obtain extra qualifications, licenses and permissions before you can practise your chosen therapy or start a self-employed business. It is essential to get local expert advice about what qualifications or permissions you need. Instead of spending money on the expensive Apostille and legalisation processes, it will probably be better to spend the money on a new training in the country you wish to move to or practise in, if that is needed. Q.26 Do I have to use your school's initials (UKCHT) in front of my certificate or diploma letters? A.26 Some of our main competitors award qualifying letters for their courses that include the initials of the school. We believe that using the school's initials in this way has disadvantages. In most cases, it tells everyone instantly that you have a distance learning qualification, and if you have several diplomas from the same school, the initials of all of them can look rather silly - imagine putting UKCHT Dip. ABC, UKCHT Dip.XYZ, UKCHT Cert.CDE, and so on after your name. Our practice is to avoid this "alphabet soup" and just use simpler designations for our qualifications. Asking you to use your school's initials on your business card, in your advertising, etc. is essentially asking you to give free advertising for the school. It is a marketing strategy, plain and simple. We could use it if we wanted, but we prefer other ways of marketing that don't require graduates to use our "logo" every time they list their qualifications from us. We are always happy, of course, for people to say that they gained their qualifications from UKCHT, and we are even happier when our graduates recommend other students to us. And we are delighted when practitioners display our certificates on the walls of their consulting rooms. Even if you are advised by another school that your diploma letters include the initials of the school, you do not have to use them. You can simply say that you have a Certificate or Diploma in the subject, or even leave out the school's initials - there is no law that says you have to include them. Certificate or Diploma initials in the private sector are mostly unregulated in the UK, though you should take reasonable care not to make it appear that you have some prestigious qualification - to give an extreme example, nobody would use the initials M.D. for a marketing diploma because those initials might indicate Doctor of Medicine. Q.27 What advantage is there in studying the course if I can just read the textbook(s)? A.27 Surprisingly, we do get this question from time to time. Perhaps some people think that a textbook-based course will not be stimulating or challenging, or perhaps they expect a course always to have its own customised material. Some courses do have their own specially written texts, but that is no guarantee - unless the provider is a college like the Open University - that the materials will be any better than the content of a carefully selected textbook. In many cases, a well-written and clear textbook can often provide much more than a paraphrase compiled by an in-house course author, no matter who accredits the course. We know that because we have seen a lot of course materials from many different providers! The advantages of taking a course of study rather than just reading are in the mental stimulation that formal study provides, and the satisfaction of earning a tangible certificate marking the achievement. Many people who are not interested in a professional qualification come back to us for course after course because they enjoy studying for its own sake. We all have books on our shelves that we have never read. Doing a course linked to a book is like having coaching to encourage you to actually study the textbook and relate the information to your life, your personal philosophy or your practice. The certification acts as your reward for finishing the task as well as a permanent proof of achievement. Q.28 Do you offer degree courses? A.28 No. UK College of Holistic Training is a private distance learning school offering adult education. It is not a university and it cannot offer degrees of any kind. Q.29 Do you have any vacancies for distance learning tutors or course developers? A.29 Sorry, not at present. Anyone wanting to write a course for us should first have completed one of our own courses with a similar structure so that they know how we work. They must also have excellent written English, spelling and grammar, and be educated to degree standard as well as being well qualified in their subject. However we cannot guarantee that any positions will be available. One of the difficulties in accepting a course written by someone else is establishing that the course is their original work and they have not used any copyrighted material without permission. Course authors need to be very aware of plagiarism and copyright infringement. In the past we have had courses submitted to us that were clearly in breach of copyright, even containing illustrations copied from books with no permission or acknowledgement. Obviously, such material would be unacceptable. Q.30 Do you provide references for employers or other colleges? A.30 It is usually difficult to do this because, if you are a distance learning student, we have not met you personally and we have not observed you practising the techniques you are learning. Also, we may no longer have your written assignments and so may not be able to refer to them to comment on how you approached your studies. To be fair, any reference we write would have to mention that the course was by distance learning. Most employers or college admissions tutors prefer references from people who have known the applicant personally, or who have tutored them in person, and will give those references much more weight than references from someone who has never seen you. Q.31 Can you help me qualify as a psychologist, psychiatrist or psychoanalyst? A.31 No, we cannot. You cannot qualify in these professions by distance learning. To be a Chartered Psychologist in the UK you must have a Master’s degree in Psychology plus additional training as necessary. A psychiatrist is a Medical Doctor with specialisation in mental illness. To be a psychoanalyst requires a postgraduate degree plus very lengthy and expensive training including a training analysis which can take years. You will find distance learning courses in these subjects but they are introductions only, and not professional qualifications. It can be a criminal offence to offer services to people as a Chartered Psychologist, psychiatrist or psychoanalyst without the full training and/or licensing. Hypnoanalysis, also called Analytical Hypnotherapy, is different because it is simply a branch of hypnotherapy and requires hypnotherapy qualifications. UKCHT, like many other schools, offers professional development courses in various aspects of psychology: these are mainly to further the education of therapists and others who may not have a psychological background. They do not qualify you as a psychologist. Psychology is a very popular subject that is studied by many people interested in the subject and its various applications. Q.32 I have an older edition of the course textbook, not the latest one that you mention. Can I use it? A. 32 This depends on the book and whether we have a course manual for the older edition - also whether we still keep a copy in our library. In some cases this may be possible, as long as your edition is not too old. Please ask us for advice and mention the specific course you are interested in. THIS FAQs PAGE WILL BE ADDED TO FROM TIME TO TIME, BASED ON QUERIES THAT PEOPLE SEND US. DISCLAIMER: All information on this page is believed to be correct at the time of writing but facts may change at any time due to internal or external changes. This information does not form part of any contract and should be checked with other sources (or with us by direct enquiry) before making any relevant decision.